This normally takes a few people by surprise…You don’t watch TV!? Well I did not say that, but I don’t watch TV very much. In all honesty, I have not had cable in almost 3 years and I think Batman: The Dark Knight Rises was the last movie I saw in theaters…that came out in 2012. Recently I was turned on to one television series by my sister and brother-in-law. So now I am almost all caught up with The Walking Dead. If you are not familiar with the show, it is essentially a show that follows the lives a group of people in and around the Atlanta area as they try to survive in a post-apocalyptic world filled with zombies. If you are wondering how I am going to pull some sort of Biblical message by using this prompt…you need to check out our blog and find out! So I watched an episode last night and there was a line that really bothered me for some reason. So, in the show, there is one character who gets separated from the group and ends up living in a hospital. Let’s call her Beth. So Beth, is living in this hospital and learning how things operate here but soon realizes that it is not all cupcakes and rainbows in this “sanctuary” from the troubles of the outside world. So this happened while I was on Pilgrimage with Holy Communion in 2005. I still remember to this day the exact Lectio Divina because it was such a powerful moment for me. The passage we reflected over was Mark 10: 17-22, The Rich Man. In this passage, a young man goes up to Jesus and asks what he must do to receive eternal life. They have a short conversation that ends with Jesus telling the young man that he must give seel all of his possessions, give the money to the poor, and follow him. The man became sad and was upset because he had many possessions. I remember sitting there and listening to others talk about how they think they would have handled this conversation with Jesus. How they think they would have felt being given this response. And how they felt they would be able to give up all their possessions. While all this was going on…I sat there in silence. But I was petrified of the thought of walking up to Jesus and asking him this question! I did not think I would have had the guts. I did not think my faith was strong enough to even have that conversation. In a single word…I was afraid. I went back and look through my journal from this past year’s Pilgrimage we took to Germany. We again used the same passage, Mark 10, for a Lectio Divina. The fear is still there…but it is not keeping me from acting like it had before. I think that is why I was bothered by the quote earlier. Peter was afraid and that was why he did not act…at that time. And sometimes our fears get the best of us. It keeps us from God. But if you feel that way…you are not alone. But when you put you faith in God, you can do great things. 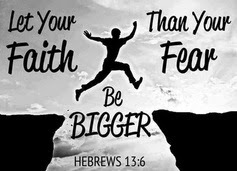 God has faith in you! I stand to praise you, but I fall to my knees. My Spirit is willing, but my flesh is so weak. So Light the Fire in my soul. Fan the flame, make me whole. So Light the Fire in my heart, again. Teach my heart to see your face.